A simple 2-stage solution for cleaning wastewater in a compact space. For use in Coagulation/Flocculation applications where suspended solids and particles must be removed from wastewater and space is limited. A coagulant, added to wastewater downstream of Westfall’s Static Mixer Model 2800, undergoes high shear turbulence. Rapid mixing is generated to disperse the coagulant throughout the liquid. As a result of the coagulant action, charge neutralization occurs and the suspended particles bind together to form larger particles or flocs. These bonded particles then flow past Westfall’s Low Headloss 3050 vanes for slow and gentle mixing with the polymers required to help the particles form bridges and agglomerate into much larger flocs. Once formed, the large flocs are easily removed by filtration, straining, floatation or sedimentation. 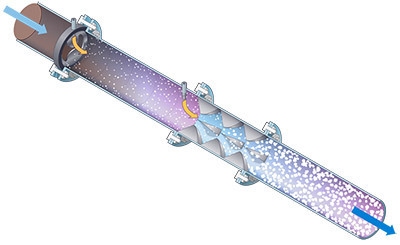 This second stage eliminates the need for lengthy serpentine piping. Westfall Static Mixer 7000 contains both a high shear plate mixer, Model 2800, for rapid coagulation and a low headloss vane mixer, Model 3050, for gentle flocculation and sedimentation. Westfall’s Coagulation/Flocculation device is installed in poultry processing plants in Mexico. The 2 stages can be clearly seen in this video: https://www.youtube.com/watch?v=GBPL_RJD30M. At the end of the second stage, notice the large floccs settling out. 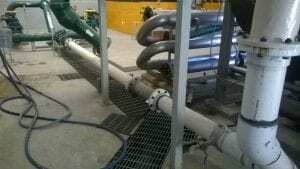 And finally see the cleaned wastewater flowing out from the plant. In this processing plant, Westfall’s plate mixer 2050 was installed in 2005 to mix coagulants with raw water and charge neutralize suspended solids. Recently the serpentine piping used for the flocculation phase was detached (upper middle) and replaced with Westfall’s pipe mixer 3050 (center). Added polymers are gently mixed to encourage larger flocs prior to removal.